Escorpion's team won, but he suffered a head injury and needed medical attention. Delta replaced Diamante. Diamante hasn't appeared in over two weeks, and it may be related to other events currently taking place. Terrible fouled Rush for the DQ. Astro Boy wore a white/silver outfit. And lost. Ultimo Dragoncito also wore a white/silver outfit. Plata had a silver outfit (but that's in his name!) Best match of the night. Dragon Rojo and Misterioso jumped Sangre Azteca as he was entering. Straight falls, with Misterioso ripping Sangre's mask off. Misterioso was a replacement for Volador. Rudos attacked the other tecnicos, and Super Porky 'ran' in to make the save. #1 contenders stipulation had not been announcers prior to the show. Wrestlers listed in reverse order of elimination. Pierrothito and Electrico eliminated each other. Dorada was over confident and pinned. 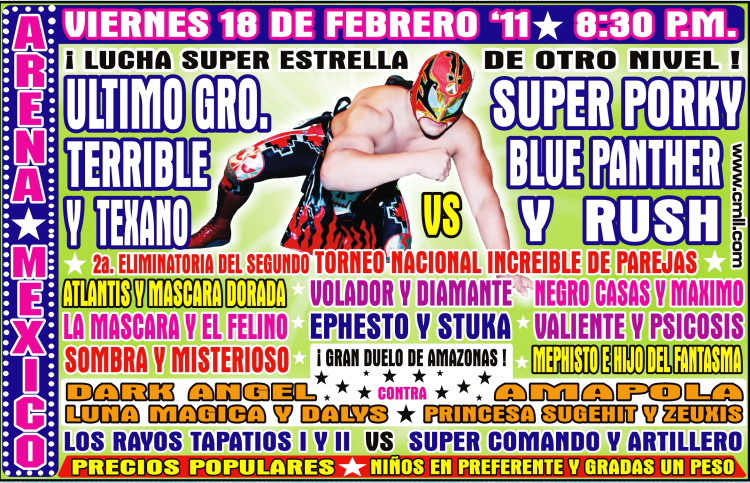 They keep teasing Dorada vs Bam Bam every time they team, and here again, but it's probably many months away. Rush replaced Sagrado. Rudos took it with the three man Guerreros entanglement submission, usually only seen with Ultimo Guerrero. Volador's legend killer feud has hastily switched from Blue Panther to Brazo de Plata. Less interesting but probably an attempt for more of a reaction. Said to be a poor match. Garza distracted the ref for a Volador foul in the end. Porky challenged for a hair vs mask match, and it's been a while since Brazo de Plata has lost his hair here. Order in reverse order of elimination. Dragon Lee knocked himself out on a dive. CMLL.com says he had memory issues, which sounds bad. Final four were Stuka/Fuego/Virus/Demus, but the rudos surprisingly beat both the tecnicos. While the ref was busy getting Stuka out, Demus fouled Virus and got the winning pin. CMLL taunts this as the student beating the teacher. Texano fouled Super Porky. Porky demanded a hair match. Rush pinned Ephesto with a back suplex. Dorada took falls 2 and 3. The reversal sequence leading to the finish was awfully familiar. Instead of an armbar, Dorada won with a fireman's carry bomb, same move he was using in his match with Taguchi. Dorada challenged for a title match and a mask match. Angel Azteca Jr. left the match with a nose injury. First two falls went long, third fall lasted under a minute. New champion! Trueno and Super Comando were the seconds. Bam Bam won the first, and Olimpico took the last two to win the title for the second time. He won the title with a half crab. Rush reversed a Texano Tornado into a small package to steal the win in straight falls. Felino and Perico did not let this stop them from dancing after the match. Mephisto subbed for Terrible. Volador lost clean to the Nudo Lagunero. Things are going right for the minis rudos: Olimpico won the title, they got another win here, and Astral and Electrico had issues with each other thru the match. Straight falls for the Cancerberos, which Virus emphasized to Demus on the microphone. Demus demanded a rematch for next week. Rush and Ephesto feuded thru the match. 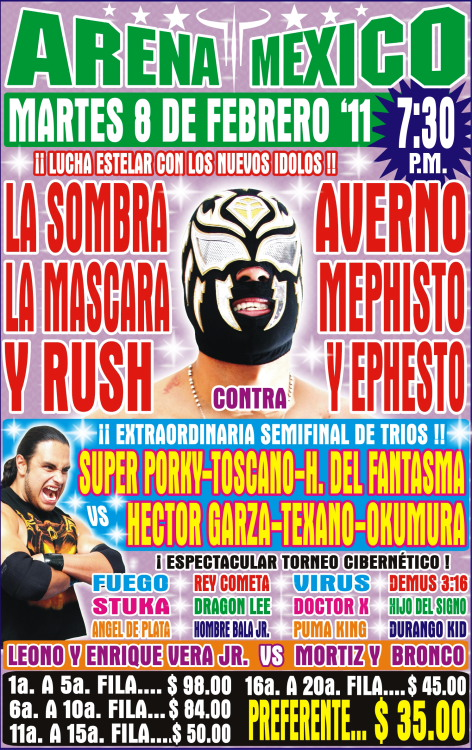 Rush beat Ephesto with a casita, then challenged for a shot at Ephesto's CMLL Light Heavyweight Championship. Ephesto did not like that idea. expected winners win, and face Team Red/Blue (Team Purple?) next week. Straight fall win for the tecnicos, Texano desperately fouling Porky in the second. Terrible & Texano continued to beat up Porky until Maximo made the save. Father and son made a hair match challenge. Texano and Terrible accepted! CMLL's recap notes the rudo fans were chanting for Astro Boy to join their side. Cesar reads into Sagrado being captain here as a punishment to Maximo. CMLL's pretty random about captains. 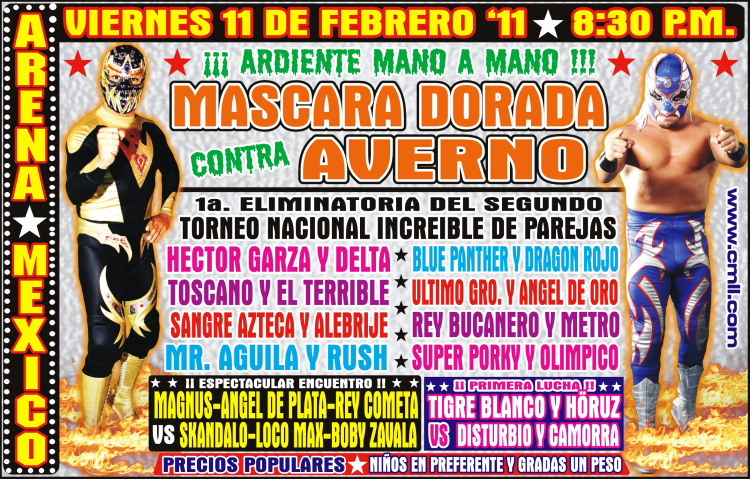 Finish came down to Averno vs La Mascara. Averno took advantage of Tigre Hispano getting knocked down by trying a foul, but La Mascara blocked that. Averno tried again, taking off his mask and handing it to La Mascara. Ref spotted it, called the DQ. Everyone made challenges for next week. Zeuxis replaced Tiffany, Luna Magica replaced Goya Kong. First Estrella Magica since October, only the third time she's teamed with her sister in main CMLL rings. Demus took the first and the third, sneaking in a foul on Virus to take the match, just like the cibernetico that started this. Virus wanted a singles match, and Demus accepted, saying he wanted the chance to prove he had surpassed Virus. New Champion! Dragon Lee seconded his brother, who won his first world championship. A big double stomp set up the final pin. La Mascara had Ultimo Guerrero in the campana, but Ultimo reversed it into his own and beat La Mascara with his own hold! Poor La Mascara. Magnus did a tornillo into an armdrag at the close of the match on Tiger kid, while his partners wrapped up the match in the ring. Sangre Azteca single handily beat both Misterioso and Polvora to take the match. Despite Perico's interference, Rush beat the last two Light Heavyweight champions in singles matches. Match went about 6:30. Straight fall win for the Dos Leyendas underdogs, though they used the ropes to do it. Champions repeat in a third match. The rudos were originally Disturbio/Ramstein, then Disturbio/Zavala, and finally Ramstein/Zavala. Rayos still won. Pegasso returns! Just in time for Rey Cometa to go missing. Arkangel filled in for him. Unlike the last time this happened with the Tuareg, Arkangel was a completely professional tecnico and feuded with Skandalo during the match. Skandalo beat him with a Skandalo Driver, and the two made up with a hug after the match. 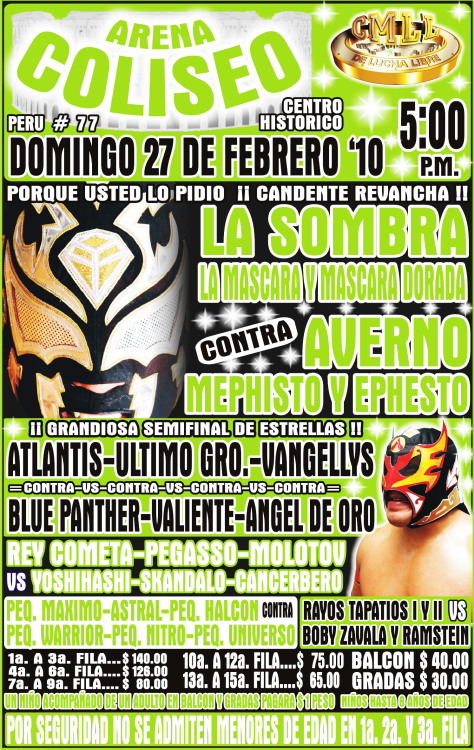 Vangelis replaced Volador. They both do start with V, I guess. Double Atlantida on Panther and Valiente to end it. Averno & friends are getting their title shot next week.